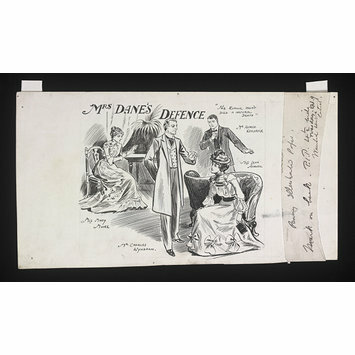 This pen and black ink illustration shows a scene from the first production of Mrs Dane's Defence which opened at Wyndham's Theatre in October 1900. It shows the four leading actors, Miss Lena Ashwell as Mrs Dane, Mr Charles Wyndham as Sir Daniel Carteret, Mr Alfred Kendrick as Lionel Carteret (his adopted son) and Miss Mary Moore as Lady Eastney. The play, written by Henry Arthur Jones, focuses on the fate of the beautiful Mrs Dane whose betrothal to the famous judge Sir Daniel Carteret is threatened by scandalous rumours about her past. Handwritten annotation on a scrap of paper to the right of the image suggests it featured in the Penny Illustrated Paper. This paper, priced 1d per issue, was published on a weekly basis between 12 October 1861 - 28 December 1907. Illustration in pen and black ink of a scene from Mrs Dane's Defence at Wyndham's Theatre, October 1900. The image was created for reproduction in a newspaper/magazine. It shows a group of four actors, two male, two female. In the foreground Miss Lena Ashwell (seated) is being addressed by Mr Charles Wyndham, behind her stands Mr Alfred Kendrick. In the background Miss Mary Moore is seated at a table, reading a letter. The image is titled 'Mrs Dane's Defence' and a quote in the top right corner reads "The rumour hasn't died a natural death". An additional strip of paper has been attached at the right of the image. A handwritten annotation on this paper suggests it featured in the Penny Illustrated Paper. Handwritten annotation in pencil on the right hand side (back) of the image. Sir William Ingram (27 October 1847 – 18 December 1924) was a Liberal politician who was elected to, and sat in, the House of Commons on three occasions between 1878 and 1895. He was also the Managing Director of The Illustrated London News from the late 1870s until 1900 and became the proprietor of a number of additional publications including The Sketch and The English Illustrated Magazine. The Illustrated London News was the world's first illustrated weekly newspaper. Founded by Sir William Ingram’s father, Herbert Ingram, in 1842 the first edition was sold on 14th May 1842 at a cost of sixpence per copy. Building from an original circulation of 26,000 to in excess of 300,000 at its peak, The Illustrated London News remained in print until 2003 and commissioned illustrations from many of the leading artists of the late 19th century. Photographs were used alongside illustrations from the late 19th century onwards but illustrations were a major feature of paper until after the end of First World War. Pen and ink illustration by an unidentified artist of a scene from Mrs Dane's Defence, Wyndham's Theatre, 1900. Given by Sir William Ingram.